불국사는 통일신라 경덕왕 10년(751) 김대성의 발원에 의해 창건된 사찰로, 과거·현재·미래의 부처가 사는 정토(淨土), 즉 이상향을 구현하고자 했던 신라인들의 정신세계가 잘 드러나 있는 곳이다. 『삼국유사』에는 김대성이 전생의 부모를 위해서 석굴암을, 현생의 부모를 위해서 불국사를 지었다고 전해진다. 그러나 혜공왕 10년(774) 12월 그가 목숨을 다할 때까지 짓지 못하여, 그 후 나라에서 완성한 후 나라의 복을 비는 절로 삼게 되었다. 탑은 불국사가 창건된 통일신라 경덕왕 10년(751)때 조성된 것으로 추측되며, 2단의 기단(基壇) 위에 3층의 탑신(塔身)을 세운 석탑으로, 경주 감은사지 동ㆍ서 삼층석탑(국보 제112호)과 경주 고선사지 삼층석탑(국보 제38호)의 양식을 이어받은 8세기 통일신라시대의 훌륭한 작품이다. 탑 전체의 무게를 지탱할 수 있도록 2층의 기단이 튼실하게 짜여 있으며, 목조건축을 본따서 위·아래층 기단의 모서리마다 돌을 깎아 기둥 모양을 만들어 놓았다. 탑신에도 그러한 기둥을 새겼으며, 지붕돌의 모서리들은 모두 치켜올려져 있어서 탑 전체에 경쾌하게 날아오르는 듯한 느낌을 더한다. 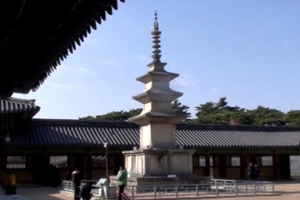 The Three-story Stone Pagoda of Bulguksa Temple and Dabotap Pagoda (National Treasure No. 20) stand to the west and east of the frontal area of the temple’s Daeungjeon Hall, respectively. 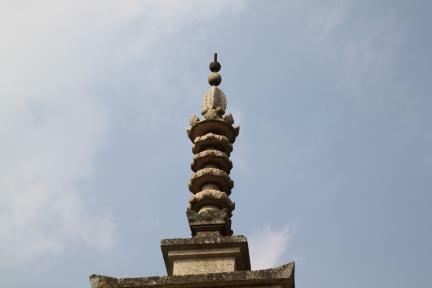 The Three-story Stone Pagoda is also called Seokgatap (“Sakyamuni Buddha Pagoda”). The two pagodas were built at the same site to reflect the content of the Saddharmapundarika Sutra (The Lotus Sutra) in which the Dabo Buddha (“past Buddha”) stands beside Sakyamuni (“present Buddha”) to prove that his Buddhist sermon is right. 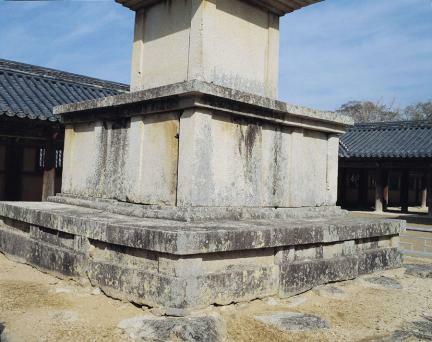 The three-story body of this stone pagoda stands on a two-story platform, displaying the traditional style seen in the East and West Three-story Stone Pagodas at the Gameunsa Temple Site, Gyeongju (National Treasure No. 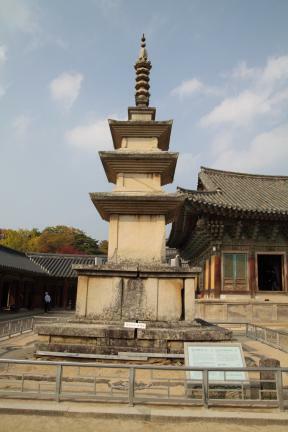 112) and the Three-story Stone Pagoda at the Goseonsa Temple Site, Gyeongju (National Treasure No. 38). 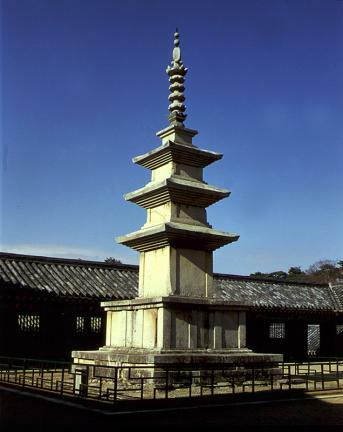 This style of stone pagoda reached its peak in the mid-8th century during the Unified Silla Period. The two-story platform was strong enough to sustain the full weight of the pagoda. Imitating the wooden construction style, the pagoda features stone pillar-shaped carvings at each corner of the upper and lower platform. 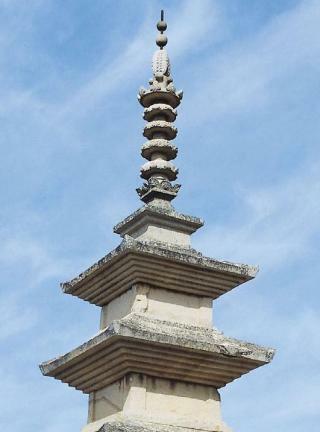 Such carvings were also made on the pagoda’s body, and the corners of the roofstone are all raised, lending the pagoda an impression of lightness, as if ready to fly away. Although the platform and body of the pagoda are simply expressed without decoration, its upper extremity looks splendid. 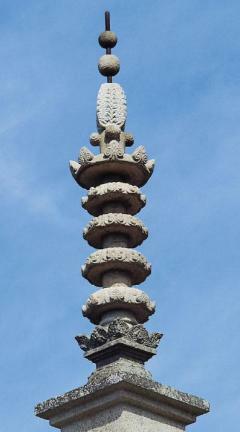 In fact, the original finial of this pagoda is assumed to have been lost sometime before the 16th century, and was only restored in 1973, imitating the ornamental finials of the East and West Three-story Stone Pagodas of Silsangsa Temple, Namwon (Treasure No. 37), which were made 100 years later than this pagoda. 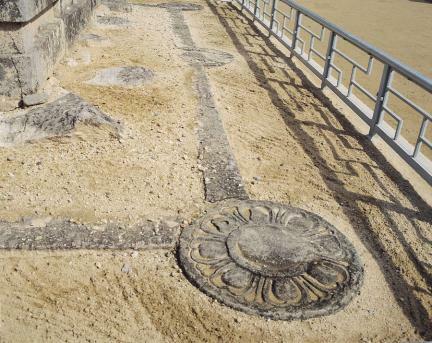 The pagoda is marked out, being surrounded by stones with lotus designs in every direction. It is separated to stand for the divine place for enshrining the Artifact of Buddha. The mark makes the pagoda look grander, being more or less unique to this pagoda and rarely seen elsewhere. The work looks very settled from any direction due to its excellent balance, and exudes simplicity and grandeur. Its construction can be loosely dated to shortly after the time when Bulguksa Temple became properly established as a temple, which, according to a record about the temple, was around 751. For many centuries the original structure was preserved in perfect condition, but, regrettably, it was damaged by robbers in September 1966. Afterwards, in December of the same year, the pagoda was perfectly reconstructed, leading to the discovery of a square space (in the front side of the second story of the pagoda’s body) containing Artifact associated with the Buddha. 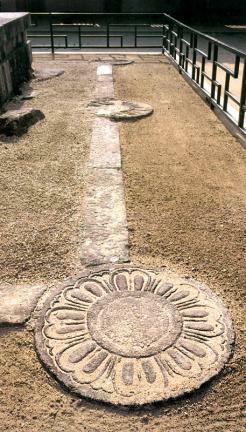 Various artifacts and reliquaries were found there, the most prominent of which was the Spotless Pure Light Dharani Sutra (National Treasure No. 126). Printed on mulberry paper, this sutra is the world’s oldest material printed by woodblocks. 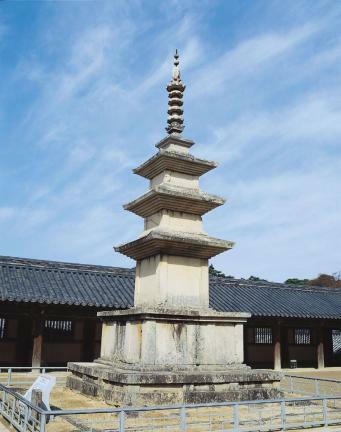 The pagoda is also known as Muyeongtap, literally meaning “a pagoda that casts no shadow.” This alternative name is related to the sorrowful legend of Asadal, a mason of Baekje who built Seokgatap Pagoda, and his wife Asanyeo. It is said that Asanyeo came to Seorabeol, the capital city of Silla, to meet her husband, but when she was unable to find him, she became desperate and drowned herself in a pond.